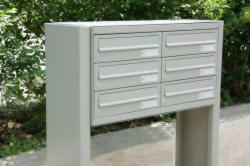 The H370-1 mailbox has a modular design that was made for banking together with other units. Post Boxes UK offers a complete post box design and installation service for properties of every size, with the only limit on design being the space you have available. Our integrated service includes schematic drawings, design, packaging, delivery and installation, and so it is a stress-free solution for property developers and management companies. The H370-1 communal letter box can be installed indoors and out. Wall-mounting, wall-recessing and freestanding installation options are available. When it comes to customisation, the H370-1 letter box offers multiple options. It is currently available in over 200 RAL colours and a selection of high-end finishes to complement all interior and exterior landscapes. Flame retardant and fire-spread resistant paint finishes are available to comply with BS476 Building Control and Fire Regulations, and we offer multi-coloured mail bank options for modern vibrant projects. Our average turn-around time for delivery is 4-weeks from receipt of your order. Larger, more complex mail banks may need additional lead time; however, we will provide you with an estimated completion date on acceptance of your project. For optimal weather-resistance, the H370-1 post box is manufactured in electro-galvanised steel or stainless steel. It is suitable for both indoor and outdoor installations. One of the easiest ways to improve weather-resistance and give your H370-1 multiple occupancy mailboxes a polished and professional look is by installing a finishing surround. Post Boxes UK offers numerous surround options to suit all wall-recessed, freestanding and wall-mounted models, such as 2mm sheet surrounds, 20mm volume trim options, and 40mm mitre cut flange surrounds. Those opting for H370-1 freestanding letterboxes have a choice of support leg options to choose from. Side support legs work well for outdoor applications, pedestal legs are ideal for indoor units, and we can combine the two to accommodate wider mail banks. For EN13724 compliance, your banked post boxes should not exceed 1800mm in height. The H370-1 horizontal post box is available with or without personalisation. Upon request, we can customise your mailboxes with apartment numbering, identification, and engraved nameplate inserts. We have most font sizes and designs and offer both engraving and laser etching options. A Eurolock non-mastered cam lock comes as standard with the H370-1 mail box. Post Boxes UK offers a variety of alternative locking mechanism to satisfy all project requirements, with 5 million differ cam locks, combination locks, padlock compatible cam locks, and RFID / NFC proximity locks all featuring within our range. Please contact us to discuss your requirements. Post Boxes UK offers multiple and bulk key options for the H370-1 apartment block letter box. We also offer replacement locking mechanisms for property developers and management agencies, with discounted rates available for bulk orders. 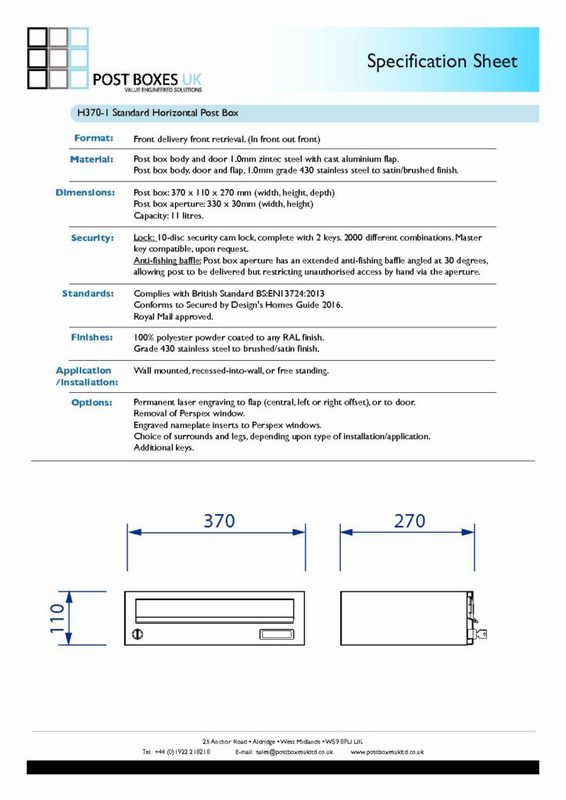 The H370-1 high-security letterbox is EN13724 approved and it complies with the Secured by Design initiative outlined in the Homes Guide 2016. To prevent tampering and unauthorised access, it is fitted with an anti-fishing device, yet it allows efficient delivery for post office workers. 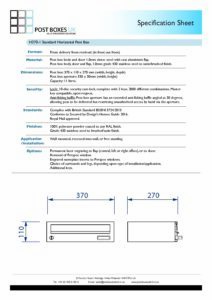 The H370-1 is a front entry, front retrieval letter box with a long list of high-tech specifications. It has a generous capacity, despite measuring just 110mm high, and it can easily accommodate A4 size documents. The stylish choice for mixed-use buildings, it is a high-capacity post box for busy postal delivery points.